In Iyengar Yoga we use many props to help our bodies ease into postures that our bodies are not quite ready for. Chairs, bolsters, belts and blocks have many uses. The blocks give support, balance and extra length when needed; as in such poses as Uttanasana (standing forward bend) or Parivrtta Trikonasana (twisting triangle). As with any DIY project, make sure you are set up properly before you begin the beguine. 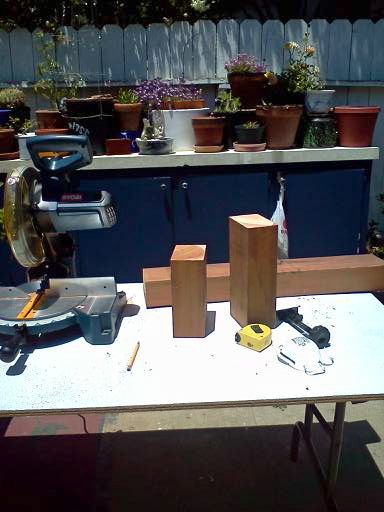 I have a good work table outside because when the redwood flies, it flies everywhere…but it smells great. I suggest thoroughly hosing off your plants afterwards too. Good Wax for good wood! 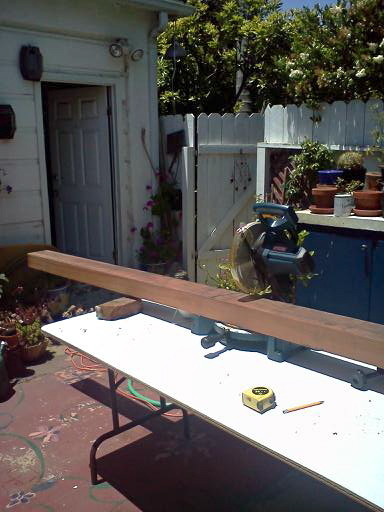 I bought an 8 foot piece of 4 x 6 redwood at a local lumber yard. Redwood is much heavier than most of the yoga blocks you will find in your neighborhood yoga studio. The blocks at my studio are either foam or bamboo. Bamboo is much lighter but isn’t as aesthetically pleasing (in my opinion) nor does it feel as solid in regards to support. Personally I’m stuck on redwood these days. At your lumber yard they will probably mill the blocks into 9 inch sections for you if you ask. It might cost more but then you don’t need the saw and can just get straight to the sanding part. My first round of making blocks was fun. I sanded them, wiped them down, stained and then varnished them. They came out quiet beautiful; looking like an art piece or cool book end. One student said they reminded him of See’s Candy lollypops…which could be a good thing. They did make my mouth water. My second round was like taking a tab of some elation drug. The sanding of the wood is so satisfying and reveals more beauty that had been hidden. 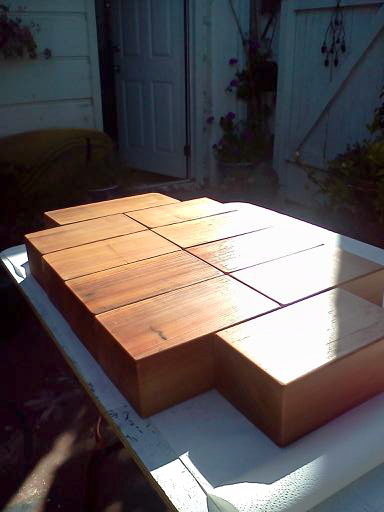 This time I waxed the blocks (why stain such pretty wood?) and excuse me for saying this but it was orgasmic. I guess it is a wood working thing, or maybe an art thing. I feel that way after a good painting too. The waxing really brought out the woods natural beauty and made them supple to touch but with the ability to still get a good grip. I also made one 12 inch block especially for one of my teachers because he is quite tall; and I never thought about how those shorter blocks make Pincha Mayurasana more difficult for those with wide shoulders. Perhaps you can even make a 2 x 6 for those that still need the support of a block in Uttanasa but not the full size of an ordinary block. Wine optional but not to be drunk until saw is put away! Anyway they are very fun to make and to give as presents to other yogi nerds you might know. That or perhaps sell them somewhere…they are certainly a lot nicer looking than what I’ve seen around…I’m just sayin. THis is a wonderful zen gift. making the perfect block, like the perfect tea. An offering to yourself and your friends. Love the explication of the purpose and process here, and the product of the process is simply stunning. Thank you. As an artist I’d say you get it entirely. Do you think pressure treated pine would work for this project? Sorry for taking so long to respond! I would talk to someone at your local lumber yard first. If you are comfortable with a saw, I say go ahead. It all depends on the finished product and how it feels to work with in yoga. Is it aesthetically pleasing to the touch and eye? More importantly, is it sturdy enough to balance on? Any suggestions on where to buy premium wood, and what type of wax do you recommend? My son just got his initial yoga certifications and I would like to make him a nice pair of custom blocks. 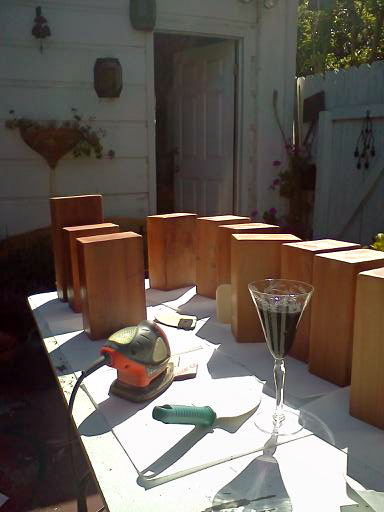 What are your thoughts on Cedar wood for the blocks!? No simple answer, sadly, as there are several varieties of Cedar, and they vary greatly. I’ve never used Cedar but I suppose it is a matter of taste as well. I like the weight of redwood and how it feels in my hand. Bamboo bothers me for some reason. If you are near a place that carries reclaimed wood, you can try different kinds – but then it gets more expensive. I know redwood isn’t very “PC”. Thanks! I think my husband has some hemlock out in the garage. I need it mostly for downward dog pose because my wrists have never been strong enough to hold those positions.